A few reputable case makers have already started creating 7.85-inch iPad cases and screen protectors in anticipation of the rumored iPad mini unveiling, including Zagg and Devicewear. The rumored Oct. 10 mailing of invites to the press came and went; however, according to The Wall Street Journal, we can still expect an unveiling of the device within weeks. Other case manufactures are also now betting on an iPad mini launch, including well-known case makers Belkin, Brenthaven, and others. The image above shows Belkin’s Screen Guard “Anti-Fingerprint” screen protector, while we see iPad mini folios in black and white in the tweet below from Brenthaven (in stock and selling from its website). XtremeGuard is also accepting pre-orders for its iPad mini screen protector. 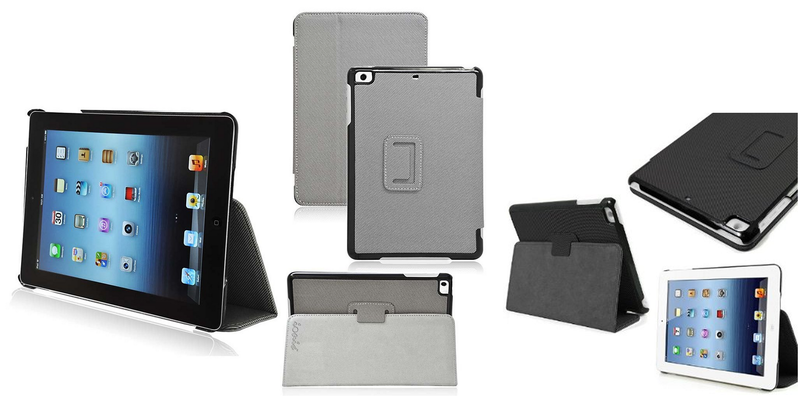 Other manufacturers have started selling iPad mini cases through Amazon. We see Ionic’s Hybrid Leather case cover with stand in the image below, while a case from KHOMO is on the right. Most do not provide exact measurements for the cases, but Brenthaven listed outer dimensions of its case as 7.5″ W x 4.8″ H x .75″ D. There are also a number of other lower-priced products, such as this black premium leather folio from Elsse, but some appear to just be repurposed 7-inch Android tablet cases.